It's no surprise that a small percentage of the thousands of apps available for the iPhone are targeted at those involved in the world of dating. Most are predictable, but a few are offbeat enough to deserve a mention and maybe even a download should you have little-to-no shame. Please don't blame us for any resulting mishaps; we're only responsible for getting you the date in the first place. The Girlfriend Keeper app is essentially an automated boyfriend, developed to ensure that you contact your girlfriend as much as you should. You notify it of your relationship's seriousness, apply a contact frequency and then choose texts, emails or both to be sent to your partner. Your girlfriend will then receive messages such as, "Diana, You have the prettiest green eyes I could ever imagine, I can't believe we have been dating for 1 year and 53 days. -Evan". The risk factor is high, unless you genuinely do possess the writing style of a robot. My Little Black Book is exactly as you'd imagine: a digital black book. It's even openly marketed at 'players'. As with the iPhone's standard address book, each contact - be it a potential or existing date - is given his or her own profile and after dates have taken place you can then rate the venue or person, attach related photos, or make general notes such as 'Must ignore his calls in future'. Eventually your iPhone will contain an enormous database of hits and misses, all securely protected by a pin number. Are you extremely paranoid? Do you ever wish it was easier to run background checks on potential dates before deciding on your next move? Enter DateCheck, a rather creepy but fascinating app that does exactly that should you provide it with basic information such as name and date of birth. Within minutes, and after parting with money for certain fees, you will know his or her criminal history, living situation, and even net worth. 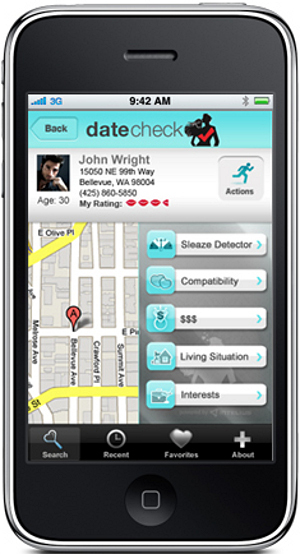 By the time you get to the date you'll feel incredibly safe but won't have any questions left which need answering. Most of us have experienced that point in the evening when the date is clearly not working for one reason or another, the awkward silences are now frequently deafening, and all you want is the green light to go home and watch TV. Date Escape aims to assist with that moment, but in a completely immature fashion which will do your reputation - should you have one - no favours. Simply press (or 'punch') the heart and up will pop an excuse sure to disgust or disappoint your date. The excuse shown in the picture above is a fairly good indication of the joys to come. It's free at least. 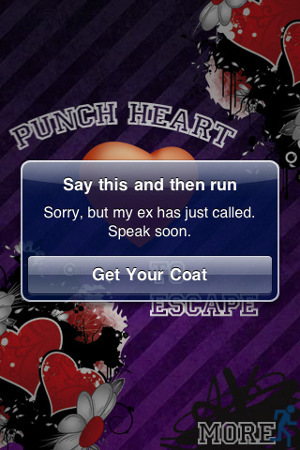 Just as cowardly as Date Escape, but rather more tactful, is Excuse Me, an app designed to give you a seemingly legitimate opportunity to escape a bad date. All you need to do is choose a countdown using the screen seen above and then wait for your ring-tone to sound. Of course the phone won't actually be ringing, but your date won't be able to tell, especially since a fake woman's/man's voice will be heard on the other end. You can then make your excuses and leave.